Michael Szafron likes to share an anecdote from one of his students who was intimidated by attending a course at Johns Hopkins, one of the top medical schools in North America. "He said, ‘I don't know if I should go, I'm from the U of S, there's going to be people from Harvard there, I won't know anything,''' recounted Szafron, an assistant professor in the School of Public Health and director of its collab­orative biostatistics program. "I said, ‘I guarantee if you go, you will be fine,'" Szafron said. "Thankfully, he took my advice. He came back and said, ‘I'm so glad I went! Not only did I know as much as they knew, I ended up helping people who were in Harvard, Johns Hopkins, or Yale. They were just shocked that they had never heard of where I was from, yet I knew more than them.'" "That's the quality of our students." As Master of Public Health (MPH) practicum co-ordinator, Szafron was one of the faculty presiding over and judging the School of Public Health Annual Poster Day held in the D-Wing Atrium of the Health Sciences complex on October 23. The event featured 59 posters from MPH practicum students as well as two dozen posters from the thesis-based graduate programs. Thesis-based graduate programs (epidemiology, vacci­nology and immunotherapeu­tics, and collaborative biostatis­tics) projects covered a wide range of public health issues. A few examples were lifestyle factors contributing to heart disease, risks of petroleum contamina­tion of soils, economic burden of dental care on families, and the challenges of delivering cervical cancer screening and prevention programs in rural Colombia. "I am happy to see the dedication and the hard work our graduate students have put in conducting and communi­cating their research findings," said Dr. Suresh Tikoo, professor in the School of Public Health and interim assistant executive director (research) at the school. Zhubing Li, a PhD student in vaccinology and immuno­therapeutics, is looking at how the body tries to defend itself against the hepatitis C virus (HCV), under the supervision of VIDO-InterVac research scientist Qiang Liu. HCV is a chronic liver disease that afflicts about 250,000 Canadians. Specifically, Li looked at a protein called PCSK9 which is naturally produced in the body. The good news: PCSK9 helps protect cells by deacti­vating the receptors the virus uses to grab a hold of the cell before it invades. Plus, the body can be induced to produce more PCSK9. The bad news: this is probably not a good idea. "Actually the upregulation of this protein is kind of harmful to your body, because if you upregulate this protein, it will downregulate the low-density lipoprotein receptors, and that will increase the plasma choles­terol level," Li said, explaining hers is basic research to find out what is happening and how. "So far we have shown that PCSK9 can inhibit HCV replication and now we want to identify the mechanism involved," she said. "It's still a long way to go to an actual anti-HCV therapeutic." 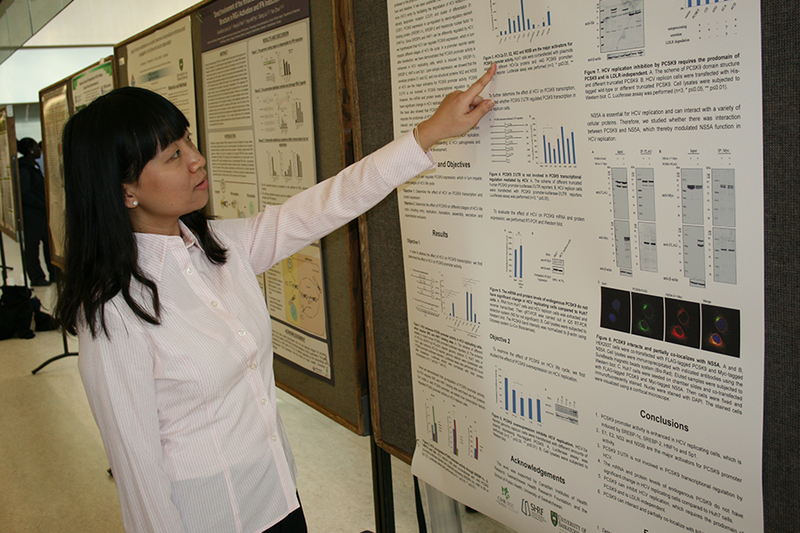 Master's student Xueying (Elsie) Zhang, also in the vaccine and immunotherapeutics program, is working on another high-profile disease, HIV, the virus that causes AIDS. One of the challenges in research to develop vaccines against the disease is to come up with a safe, economical, non-human model to study the virus over time. "HIV-1 is a chronic infection in AIDS patients, so we want to build a chronic infection model in mice," Zhang said. She explained initial results testing a vaccine on these mice are promising, and should help contribute to efforts to eventu­ally develop a human vaccine. Other Research Day projects focused on people's behavior, such as how they get around. Epidemiology graduate student Dana Ramsay is taking advantage of a lucky accident in the Saskatoon Household Travel Survey, commissioned by the City of Saskatoon, Warman and Martensville. "They were looking at different travel behaviours, how different people take the bus, what routes, how long, but what they did is also collect informa­tion on health," Ramsay said. This made the survey a rich source of data for studying active transport—that is, walking, bicycling and transit— and its effect on people's body mass index (BMI) as a measure of health. Ramsay uncovered that, as one might expect, active travel was favourably associated with BMI. However, a different picture emerged once she looked, not only at income, but also education, employment levels and social deprivation (e.g. single parents and people living alone). Once these factors were considered, Ramsay found active travel had a beneficial associ­ation with BMI—but only for higher income groups. "For the three highest income categories, we see lower BMIs, so active travel appears to confer a benefit," she said. "The lowest income category—that's below $25,000 in household income—the data show they are not benefitting from using active travel." Ramsay explained the findings could guide policy makers to ensure programs to encourage active travel do not leave anyone behind. Another behavioral question, people's reluctance to get vaccinations, is something Vaccinology and Immunother­apeutics PhD student Stephanie Ortynsky hopes to explore. This reluctance, formally referred to as vaccine hesitancy, is an increasing global health concern, with diseases such as whooping cough and measles making a comeback due to insufficiently vaccinated populations. Ortynsky explains the WHO (World Health Organiza­tion) and UNICEF have recog­nized the problem and added two questions to their biennial survey on vaccines, supplied to all 195 WHO member countries. Of the 180 that responded, 131 reported vaccine hesitancy and identified people's reasons. "Things like religion, culture, gender, socioeco­nomic factors—many countries reported that's what they were coming across when they were looking at recommendations and why people were hesitant," Ortynsky said. The narrative also differs greatly by country. For example, in some African countries some people think if they get vacci­nated they won't be able to have kids, while in Canada, it is often a question of people demanding vaccination be an individual choice. Ortynsky said initial findings show vaccine hesitancy is on the rise globally, and more study is needed to develop strat­egies to combat the trend. "It's still in its infancy that they're actually monitoring it at a global level," she said. Dr. George Mutwiri, interim executive director of the School of Public Health, emphasized the "very high quality" of the student research presented. "This is a reflection of the ability and commitment of our students and the leadership of our faculty," he said.